Devki Sabarwal (Sridevi), a biology teacher, who lives a happy life with her husband Anand (Adnan Siddiqui) and two daughters. 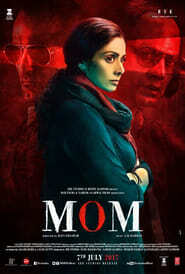 Her elder daughter Arya (Sajal Khan) goes to a party late night and ends up getting raped and thrown besides a road by her classmate who loves her, his brother, a watchman and Jagan (Abhimanyu Singh). Arya now is hospitalized. After few days, Arya gives her statement and all the culprits are sued to the court. Judge doesn’t find enough evidence to prove them guilty and leaves them. Thus, Law and force both fail to let Devki get justice. Devki gets in contact with DK(Nawaz), a detective. He gives Devki an information to assassinate them. Thus, Devki tries to seek revenge from them. Will she accomplish her task or no?